Comics In 5 Panels: Cartoon Month: Duel Masters. How come no one likes the stuff I like?! Such as the trading card game Duel Masters. The game, as well as the animated series, has been accused of being a cheep Yu-Gi-Oh ripoff. But the game is more like a child-friendly version of Magic The Gathering. And the show has little to nothing to do with the plot of Yu-Gi-Oh. Shobu Kirifuda haven't seen his father since the day he left him and his mother, leaving nothing behind but a deck of Duel Masters cards for his son. Since that day, Shobu has practiced playing Duel Masters, hoping to be a Kaijudo-master(someone who can summon real monsters) like his father. Let's be honest here; the show is not genius. But it's still entertaining. And calling it a Yu-Gi-Oh ripoff is unfair. Sure, Shobu has weird hair that KINDA looks like Yugi's, but that's pretty much it. His personality is completely different, and he doesn't even dress like him. And unlike Yugi who doesn't rely on one tactic, Shobu is more of a "attack first, plan later" kind of guy. His goal is different as well(to become a Kaijudo master and find his father). I think I speak for everyone when I say; What's wrong with this picture?! 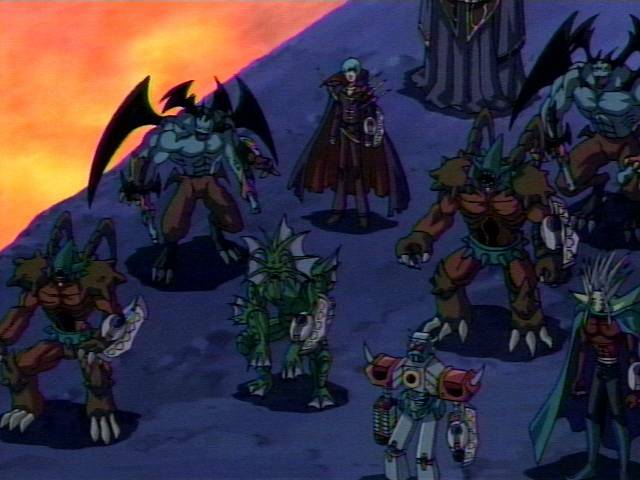 There are a couple of reasons to why I enjoyed the DM series more than Yu-Gi-Oh. The first being that the games goes a lot faster, so that we won't lose interest due to filler dialogue between the players who can use minutes talking about WHAT their cards can do, and HOW they will use them instead of, you know, DO IT! Another thing I like about the DM show is that it doesn't take itself TOO seriously. The people who translated the series to English knew from the start that the entire premise was silly and ridicules and made the show part parody and yet make it possible to keep the heart of the show. And that was two years Yu-Gi-Oh Abridged episode 1! All I'm saying is that if you like cardgame TV-shows and can accept that it in theory is a stupid concept, then you might enjoy Duel Masters. It has some nice games, a fair potion of drama and some pretty cool computer-animated monsters. So, that's my thoughts of the Yu-Gi-Oh ripoff. Next time, I will talk about a Pokemon ripoff.